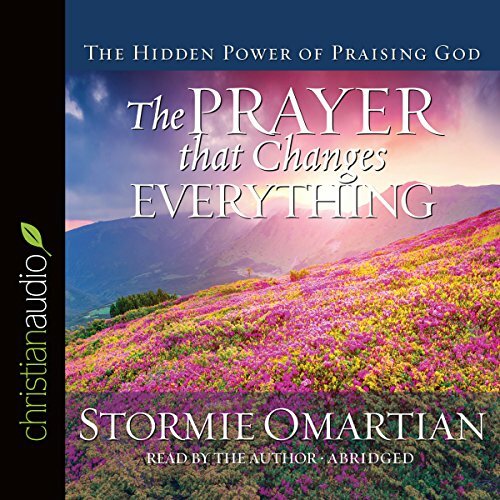 Stormie Omartian inspires listeners to open their lives to the prayer that changes everything - the prayer of praise to God. This best-selling look at prayer and worship has a fresh cover for a new audience. Intimate conversations with God often focus on immediate needs, concern for others, and direction regarding his will, but praise requires believers to look beyond themselves and their circumstances and place their attention solely on God. Stormie shares personal stories, biblical truths, and practical guiding principles to reveal the wonders that take place when Christians offer praise in the middle of difficulties, sorrow, fear, and, yes, abundance and joy. Study questions are incorporated into each chapter so that listeners receive opportuniies to put what they learn into practice. The Prayer That Changes Everything helps them uncover the amazing power, benefit, and freedom that can be found in praising God. Beautifully told with such reverence to our mighty God. Testimonies she shared through the audio were very encouraging. Praise Him! Jesus is Lord! This was a wonderful book and very well read!!! Helped me to remember to praise God through everything no matter what it may be. Praising God instead of complaining will change your life!!! Everyone desiring a closer relationship with God should get this book. It will change your life. Definitely very helpful and encouraging, recommended it for anyone who is really struggling spiritually! I'm learning so much with Stormie!! I have learnt so much on my journey to learning how to pray. Every one of Stormie' books speak to me- as a wife, a parent, a woman.